It's axiomatic that as the population ages, the power of those - ahem - more mature consumers should grow ever greater. But not in the mobile phone market it seems. Austrian manufacturer Emporia has had to resort to direct sales of its latest grey gizmo - a mobile phone designed especially for older users - because high street phone shops apparently won't stock it for fear of damaging their yoof-oriented brands. 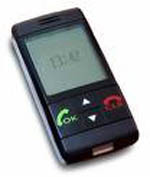 The £170 Life Phone, has large, easy-to-use buttons and an orange screen for better visibility. It won't teach users to spk txt, but they probably won't want to butcher the Queen's English like that anyway. What really sets it apart is its red panic button, allowing users fast access to five designated numbers. Calling the emergency services aside, imagine just having to hit one button to get your son to pick you up after an evening out - sweet revenge. With 19.4 million people aged 50 and over in Britain today - and an estimated 24.5 million by 2020 - those companies are potentially kissing goodbye to an awful lot of grey pounds.